Marriott challenged EDI students to redesign and identify opportunity areas in the arrival experience in order to increase member loyalty. EDI students set out to meet this challenge by using the design process, from observations to in-depth interviews, synthesis and analysis, secondary research and strategic considerations. Their solutions are part of a cohesive portfolio called Marriott Unburdened. Many business travelers do not have time to go to their hotel before or after work so they must compromise comfort by carrying their luggage with them, burdening and inconveniencing them on account of their hectic schedule. They are looking for an elite travel experience that is efficient and convenient which does not sacrifice the human connection. Through four solutions, the student team targeted various pain points in the users' journeys. They created a cohesive portfolio of solutions called Marriott Unburdened that function together or as stand-alone solutions. The hero solution is called Bellair and it targets business travelers and consultants who are burdened by their luggage at work and dinner before they have time to go to the hotel. With Bellair, when a guest traveling for business reaches their arrival airport, they leave their luggage in the care of a Marriott employee near baggage claim who ensures that the luggage will be at the guest’s hotel when he/she checks-in after work. Marriott groups luggage together and transports it to the correct hotel throughout the day, unburdening the guests from their bags. Business travelers are burdened by their luggage when they must take it to work with them because they do not have time to check-in at their hotel due to their hectic schedules. Bellair addresses this frustration and also aims to make Marriott a travel company by taking luggage off of the guest's hands at their arrival airport. Marriott texts the guest prior to their arrival welcoming them to the city and giving them the opportunity to make any special requests (extra towels, pillows, and so on). Requests from previous Marriott stays are also noted and asked if they would like to be repeated. Essentially, the existing Marriott AYS functionality existing in the app is brought to the texting platform. Some guests see a high barrier to entry to utilizing the Marriott Mobile App. Instead of excluding them from the app's functionality, Mtext brings limited functionality to a platform which they are already familiar with. This is especially true for baby boomers and business travelers who are resistant to change. The Marriott App uses geolocation to track the guest up to 12 hours before check-in. 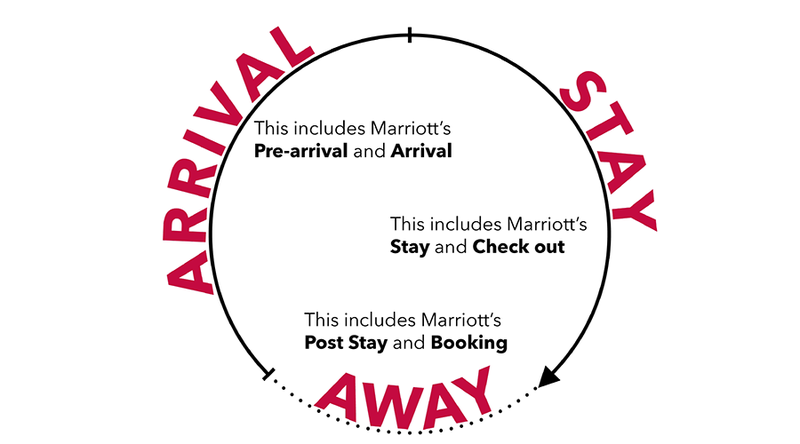 When the guest nears the hotel, Marriott is notified and can begin the check-in process. The guest simultaneously receives a notification through the Marriott Mobile App that "Pamela at counter 3 is waiting to check you in." Once arriving at the hotel, the guest can beeline to the correct podium to pick up his/her room key. Business travelers tend to have hectic schedules and wish to complete the check-in process at hotels efficiently while not sacrificing the human connection which many guests form with hotel employees due to the frequent nature of their travel. Frequent travelers to a Marriott property can opt to store a select number of business garments with the Marriott between stays. This allows them to travel lighter and they can also request that their items being stored are laundered. A concept extension is that a guest's garment bag could be transferred between Marriott properties for different business trips. Mobile Closets already informally exists in the form of luggage storage. Through their research, EDI students found that the arrival experience can be enriched by considering what happens before arrival. They saw that the journey that various loyalty members take to get to their hotel is strongly related to their arrival experience and their stay. Using this mindset, EDI students re-framed the existing Marriott framework to create better opportunity areas. For each one of the Unburdened solutions, EDI students created executive summaries and detailed service plans so that Marriott could easily implement them. The student team considered the desirability, feasibility, and viability of each solution and then ranked them accordingly so that Marriott could know the risks, benefits and next steps to each one.